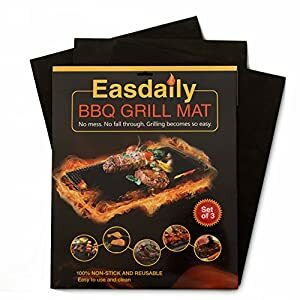 It wasn't too long ago that I discovered grill mats, and I have tried out and reviewed a couple of others as well as this Easdaily BBQ Grill Mat Set. I have been very happy with the way these work. This set is very similar to the others I have used, and are a big improvement over using aluminum foil to line my baking pans and charcoal grill. The grill mats are nonstick and easy to clean, so I don't have to waste hours on cleanup. I can just give them a quick wipe down with hot soapy water, or run them through the dishwasher if desired. I generally just wipe them down because nothing sticks to them so they wash easily. Not only do they protect my pans, and keep my food from sticking, but they also keep small foods from falling through the grates on your barbecue grill. I can cut up veggies and throw them on the grill along with my steaks or burgers, and I don't have to worry about the smaller pieces dropping through the grates into the coals. If you have never tried these mats, you should. I think they are a great way to save time and effort on cleanup, keep your foods cooking nicely, and save on waste from aluminum foil that I used to use for lining my grill and baking pans.